Stores reference 22c/438. Size 8. 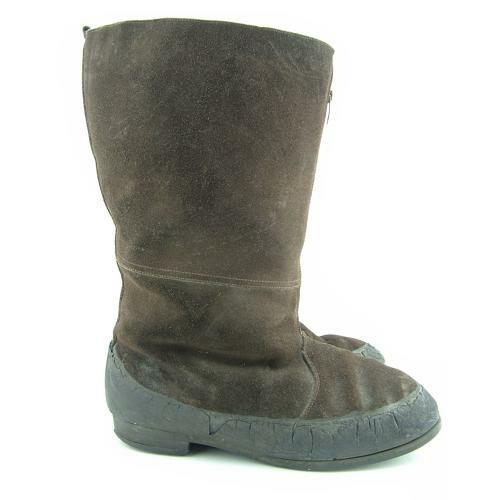 The brown suede uppers are lightly marked and rubbed but generally in good to very good condition. Unfortunately the rubber “galosh” sections are rather hard and cracked with sections missing. Good working Air Ministry marked 'Lightning' zips. The original stitched 'Redfern' soles are worn and the left is cracked. Both heelplates show considerable use. Light soiling of the dense fur lining which is otherwise in very good condition. Complete with insoles. Air Ministry and A.I.D. marked zip tongues. These are genuine 1940 pattern boots, not the more commonly found 1941 pattern with the ankle strap removed. A rare find these days. Let down by the rubber galosh but priced accordingly. Named to the owner. Stock code B23360.